So, yes, maybe I have a thing going on with meatballs. You guys seem to love them so I doubt we really have a problem, right? I decided to do a little searching about the history of meatballs (nerd alert!) and I found out that nearly every region of the world eats meatballs in some form. I don’t do much thinking about sports – not that I don’t like them – but other things take priority in our house. Sports are fun, tailgating is more fun and (I’ve said this before), sports are more about the food than the actual game. I know this is true for some of you, too. So that one big, super football game that is coming up? 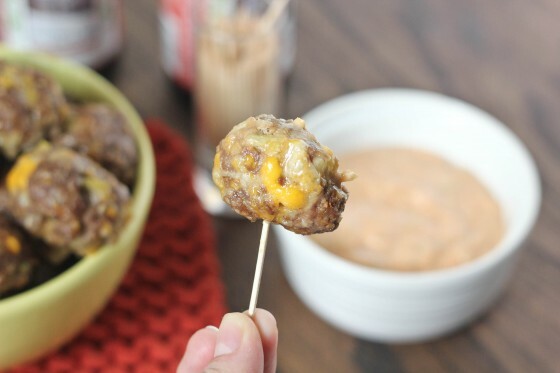 Well, here’s your appetizer: cheeseburger meatballs. Cheeseburgers are a tailgating must, am I wrong? So I was brainstorming some tailgating recipes and my mind kept going back to a classic cheeseburger – you can’t have a tailgate party without cheeseburgers. But how do I turn those into a bite-sized, travel-friendly snack? Why not just throw all of the traditional cheeseburger toppings into some ground meat with an egg, seasonings and some breadcrumbs and call it a meatball? B.i.n.g.o. A few weeks ago I was received a load of new toys from Calphalon. Included was an XL Digital Convection Oven. You guys, Paul has never been so excited about a new kitchen tool as he was when we pulled this one out of the box. I just so happened to be making the meatballs that very day and the oven was the perfect way to cook them. It heats up so quickly, cooked the meatballs with a really even brown on all sides and my 9×13 pan fits in the oven – perfection! I think Paul has used it nearly daily since we took it out of the box and just yesterday I said to him “I really love this little oven”! Oh, and come back on Wednesday for a “round 2” recipe with these meatballs! A twist on a tailgating favorite: cheeseburgers. A savory meatball recipe with cheese, pickles, ketchup and onions and a "special" dipping sauce on the side. In a large bowl, mix the beef, onion soup mix, chopped pickles, ketchup, garlic powder, egg, salt and pepper together until combined. Add the breadcrumbs and cheese and mix well. At this point the mixture should hold together very well. If it doesn't, add another 1/4 cup of breadcrumbs and mix, repeating until the mixture holds together, as if you were making a meatloaf. Preheat the oven to 375 degrees. Lightly spray a 9x13 cookie sheet with non-stick spray. (I use a Misto sprayer.) Roll the meatballs into approximately 1-inch balls and place, evenly spaced, onto the baking sheet. Bake in the 375 degree oven for 15-20 minutes, until cooked through. While the meatballs bake, mix the ingredients for the sauce and refrigerate until ready to use. Baking the meatballs helps to cut down on added fat of frying. I also used very lean ground beef for these as well. To cut down on fat even more, use ground turkey in place of ground beef. Note that if you use ground turkey, you will need more bread crumbs for the mixture to hold together. These are such a fun appetizer idea Cassie!! The gooey cheese oozing out is killing me! My husband just walked by and saw your post on my screen. Exact words: “When are you making THAT? !” Obviously, we are going to have a hit! A) Tailgating is more fun. And B) DAMN! I didn’t think cheese burgers could get any better! What a genius idea! I can always count on your for new meatball recipes..one of my favorite apps! These sound perfect! These look fantastic & perfect for super bowl! How exciting on your new “toys” as well. I have convection toaster oven and just love it!!! Woah, woah, woah. These look mouthwateringly good. I don’t even like sports, but I’d watch them just to eat some of these! I’muna open my mouth and let you just throw in about 500 of these. Coo? These look amazing! What a great idea to get al those flavors in one bite. My LIFE is a thing about meatballs — especially ones that taste like cheeseburgers! Oh my yum. You think anyone would notice if I just walked away with a whole tray of these? I never thought of cheeseburger meatballs before. Yum!! Is it wrong that I am craving these meatballs at 10 in the morning? These are perfect for a football party or just to make for my hubby. He would love these and devour them in now time. Perfect Super Bowl food! I adore the pickles inside of the meatballs, cuz ya gotta have pickles with a cheese burger! I have no words on this one, Cassie. I just wish we lived closer. ok Cassie…….. it is confirmed. I love you. 🙂 Kevin will go CRAZY for these!! I feel like I say that with each post. I also say I’m going to make everything you post and then am too lazy. These however, will be made. Ravens (our team) are in the super bowl and I need to make some killer snacks for it. These are on the menu!!! I think I’ll make some with ground turkey too. Oh my gosh the oozing cheese is just insanely awesome! These look so tasty, Cassie! Meatballs are always a hit around here and cheeseburger sounds wonderful! Ohhh these would be a huge success in my house! And by success I mean… I’d eat ALL OF THEM! Wow, I love this thing you got going on with meatballs! I could devour like 10 of these just as an appetizer! I’m going to open my mouth and I want you to just toss these little guys in one by one, mkay? Seriously. I make cheeseburger meatloaf all the time…how did I never think to turn that into a meatball?! My boyfriend would love those. I think he’d lick the screen if he saw them. Ha ha! this is seriously the most perfect way to have a cheeseburger without all that drippy mess during a football game or any sport on the tv…can you pop a few in my mouth?! OOOOZZZING cheese?!!!! HECK HECK!!! Love these! GIMMEEEEEEE! Oh, Cassie, these meatballs are epic! These are so fun! I want them right now! What a fun idea! I am all over just about any flavor meatball I can get! Is it just me, or would these make perfect, little, mini sliders too? Can’t wait to try them! Brilliant! My super bowl party attendants thank you in advance! Meatballs are so “in” right now…actually (as your scholarly research suggests), maybe they were always in and I’m only just now noticing. 😉 In either case, these look fantastic – so perfect for football season munching! 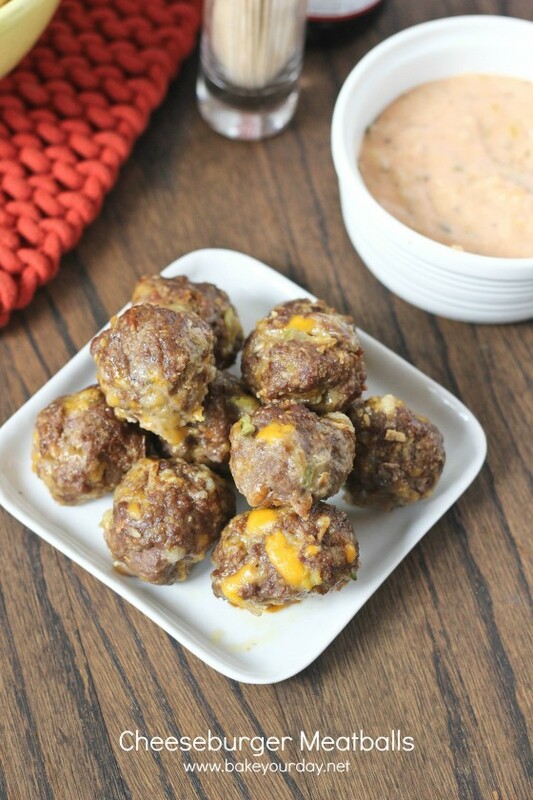 What a great idea for a meatball and a game day snack!! My hubs would gobble these up without batting an eyelash. Looks great! I totally look up the history of food too, It’s so interesting! And I’m with you, football might as well be called foodball, it’s all about the food for me! I was just telling E last night that I wanted to make meatballs this week – totally trying this cheeseburger version! OMG, that looks seriously delicious! I think these are the best thing I’ve seen all day. I want to skewer em up and dunk em in some spicy mustard! These are definitely happening at my next neighborhood happy hour! They look SO scrumptious, Cassie! Hello SuperBowl food!! I don’t wnat to wait for Superbowl to devour these!! Woah, I love a good cheeseburger and I love a good meatball. This sounds like the total best of both worlds! Yes. Yum. Must make these!! Ooooo…fabulous! What an awesome way to eat meatballs!! Whaaaat?! Why are these not a commonplace thing?! I’d never heard of these until now. 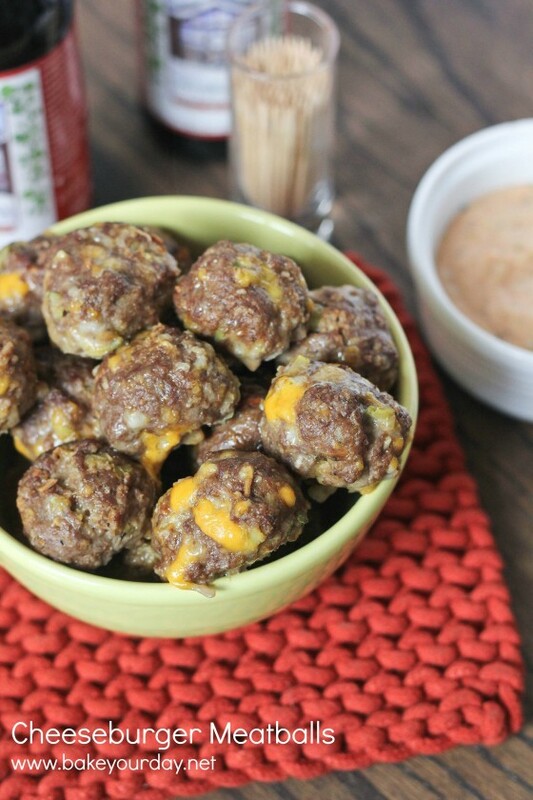 Cheeseburger meatballs. It’s so… genius. They look amazing! Not a fan of meatballs.. until tonite! made these.. oh my goodness GOOD!! Wrapped in a third of a crescent roll after they are cooked for an additional 10min is amazing for those like me that like a little breading on their cheeseburgers. Then they don’t even need any dip! 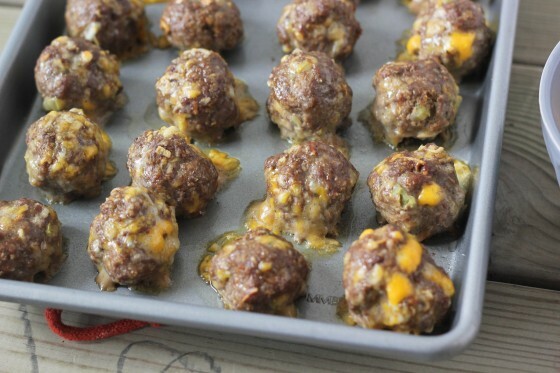 Pingback: Cheeseburger Meatballs | Hungry, Darling?